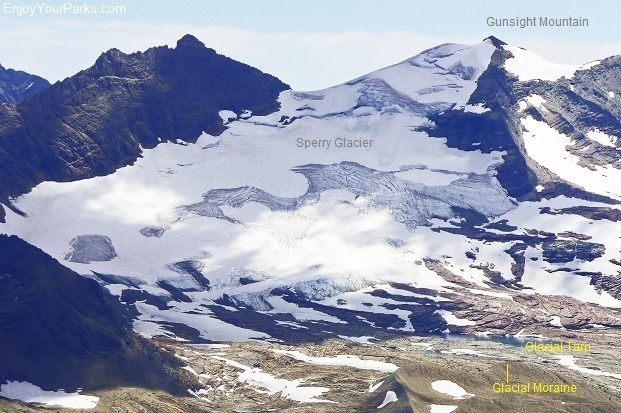 Gunsight (9,258 feet) is located near the Sperry Chalet, and the great Sperry Glacier rests on its northeast face. 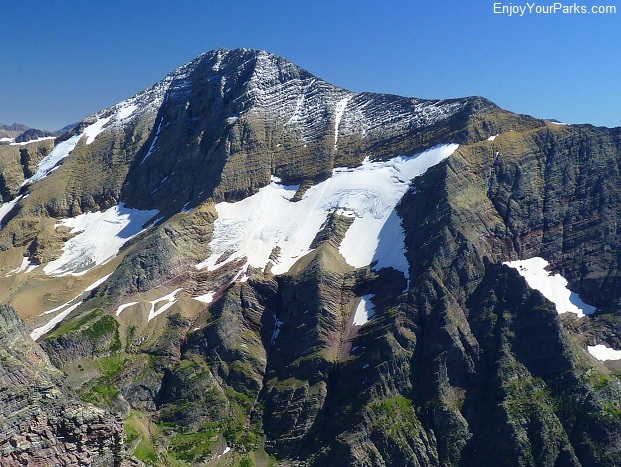 This famous mountain is named "Gunsight" because it actually has two peaks- a west peak and an east peak. At the right angle, these two peaks create the appearance of a gunsight, thus the name Gunsight Mountain. 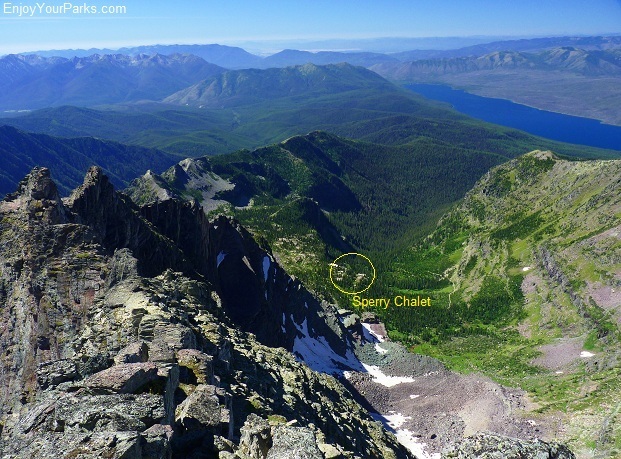 Gunsight Peak is approached by taking the Sperry Chalet Traihead at Lake McDonald Lodge, and then when you're almost to the chalet, you take a left onto the Sperry Glacier Trail. Just beyond Comeau Pass the climb begins. This is a 24 mile day with a 6,105 vertical elevation gain! Now that's a workout! 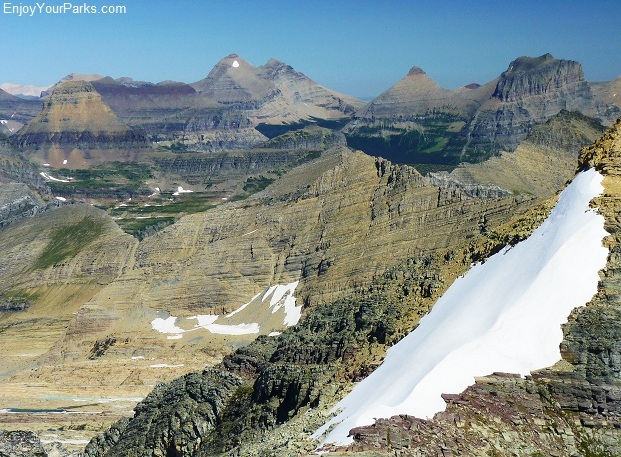 This is a view of Gunsight Mountain from the Sperry Glacier Trail. The glacial tarn is named Akaiyan Lake, which is directly below the Sperry Headwall and Comeau Pass (to the left, not pictured). 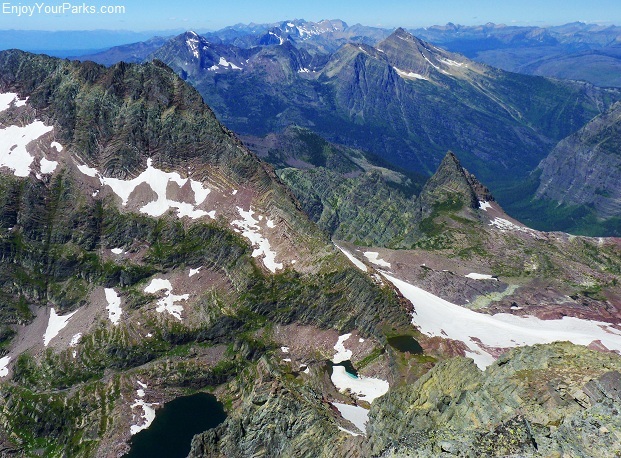 This is a view of Gunsight Mountain and Sperry Glacier from the summit of Bearhat Mountain. The camera is facing south. Note the two peaks, making it look like a gunsight. The tallest of the two peaks is furthest to the right, and that's the summit we climbed for this page. 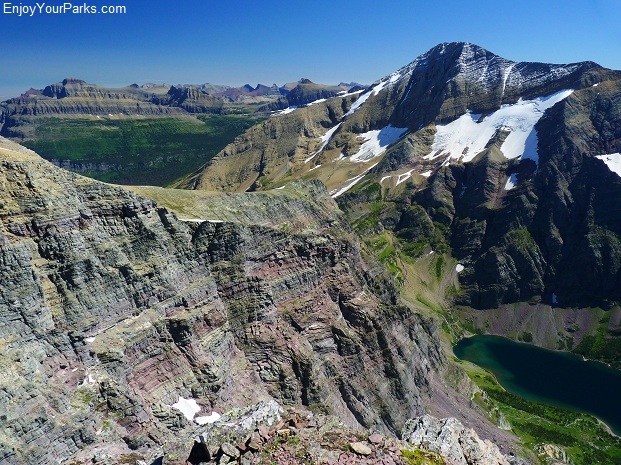 This is a view of Gunsight Mountain from the Hidden Lake Overlook near Logan Pass. This angle better illustrates the two peaks creating the "gunsight" appearance. We climbed the sharp peak to the right for this page. 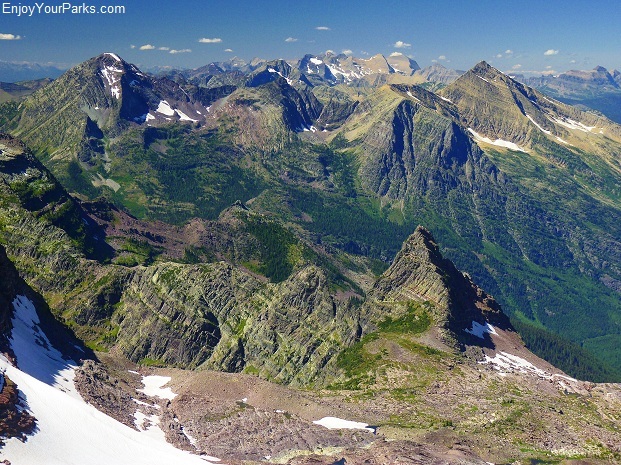 This is a view of Glacier Park's remote Livingston Range. We are facing straight north into the range. 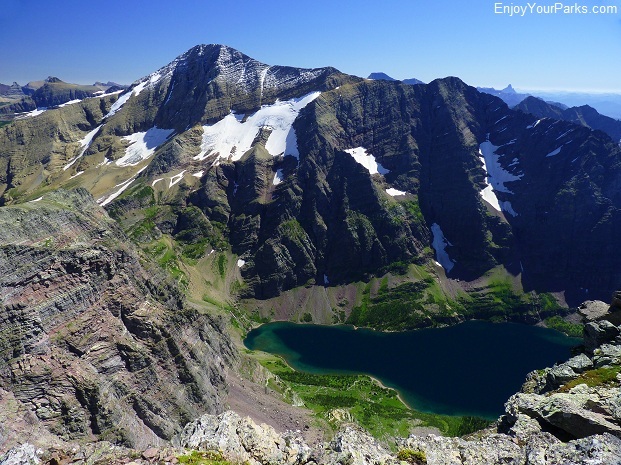 This range runs north and south and extends from Lake McDonald all the way to the northern border. 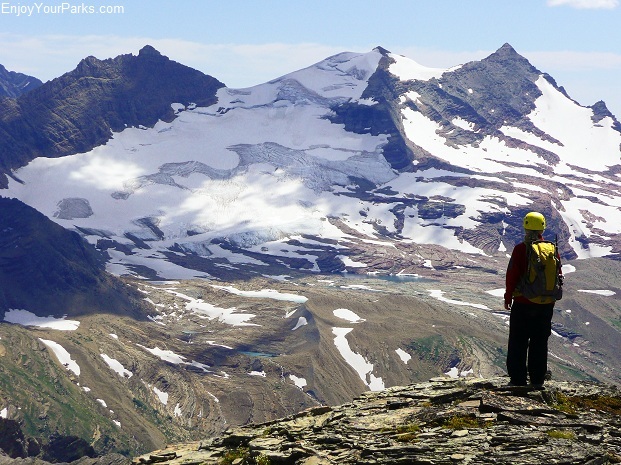 These are some of the most remote peaks in North America. 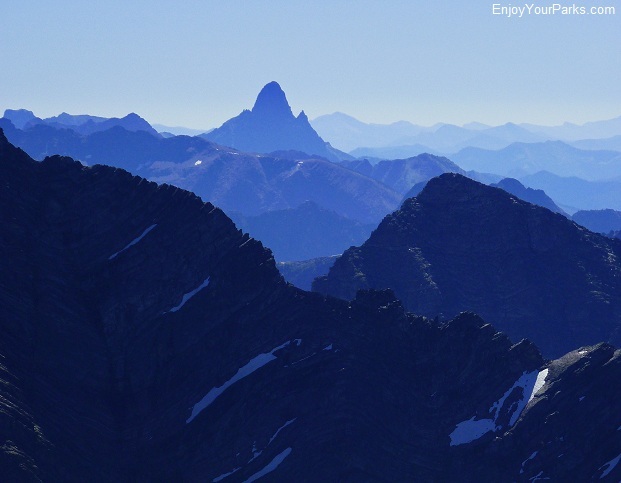 The sharp peak located at the lower right corner of the photo is Little Matterhorn. 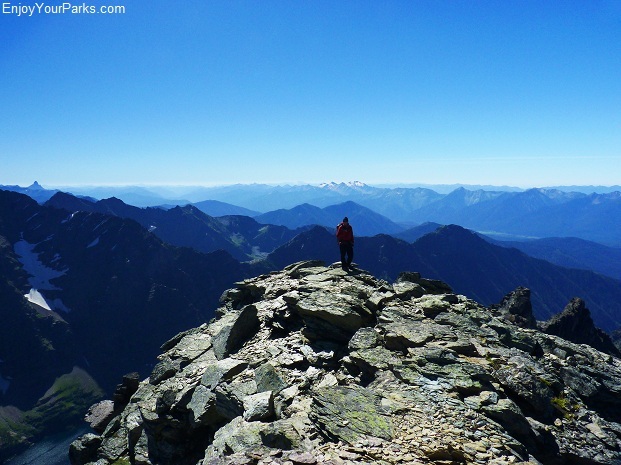 Here's Shannon standing on the west summit, looking acrossed to the east summit of Gunsight Mountain. The peaks of the Logan Pass area are in the distance. 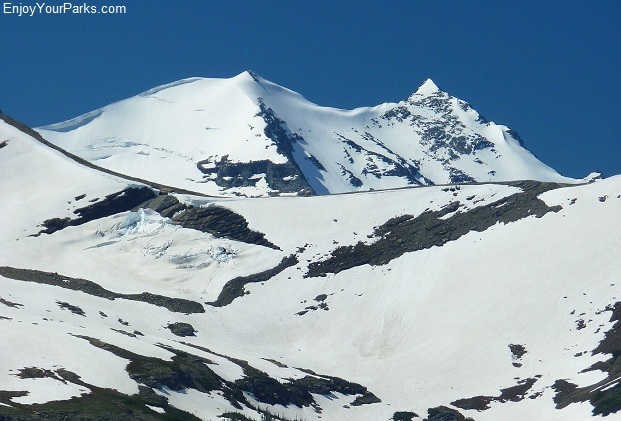 The Sperry Glacier rests below the east summit, along its northeast face. The glacier cannot be seen from the west summit. 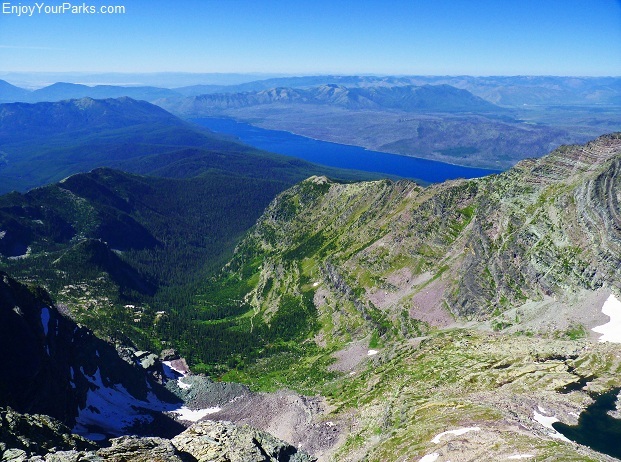 This is a view of Lake McDonald and Sperry Chalet from the summit of Gunsight Mountain. 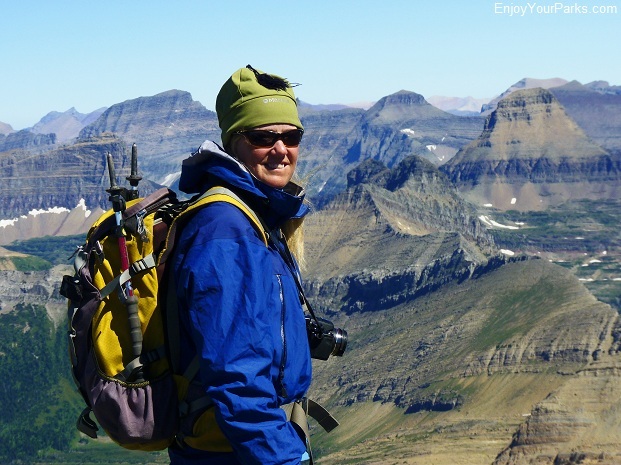 You can see forever on the summit of Gunsight Mountain! There is an ocean of peaks when looking to the east. These are all peaks around the Logan Pass Area. 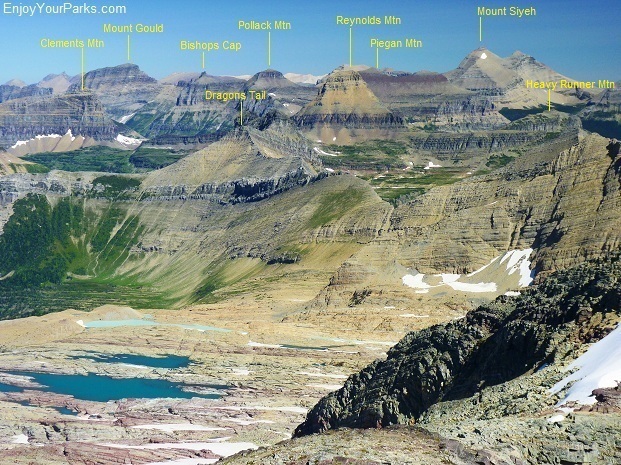 This is a view to the east, showing the many peaks of the Logan Pass area. Here's a view to the west. The lake far below to the left is Lake Ellen Wilson. 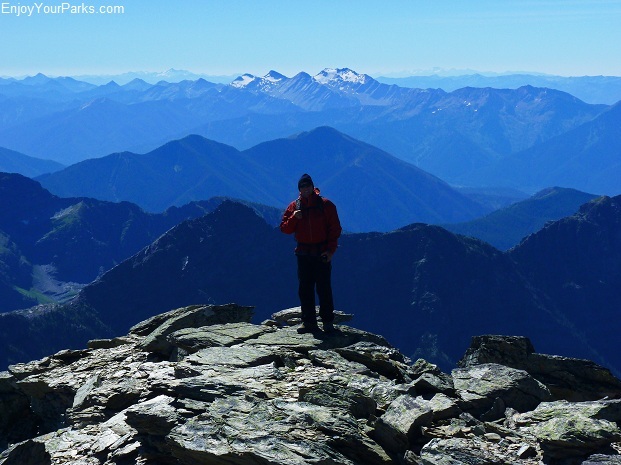 Mount Jackson as viewed from the summit of Gunsight Mountain. 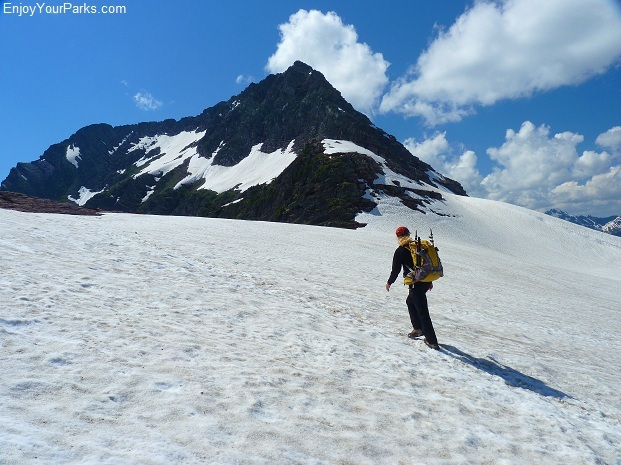 There's always snow fields to navigate when climbing Gunsight Mountain, even in late August. 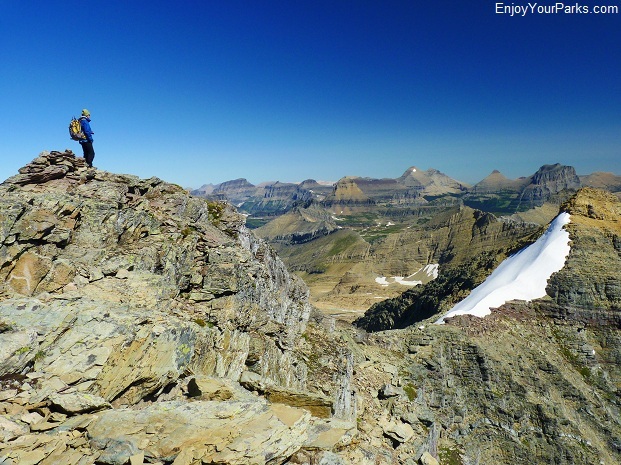 The Lewis Range runs all the way from Logan Pass up to Goat Haunt. We picked a perfect day to climb this beautiful mountain. 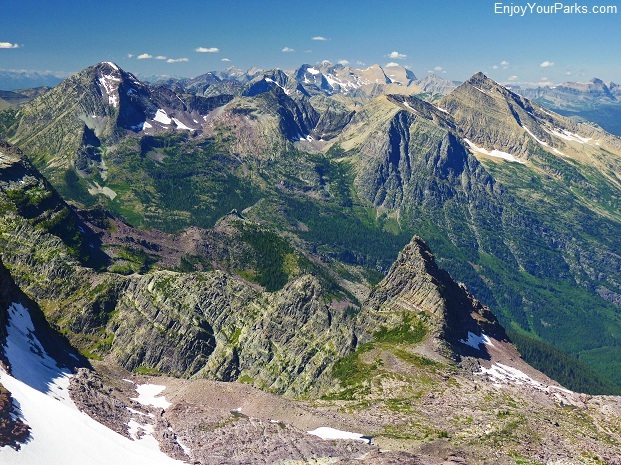 Another view of Mount Edwards (to the left) and Glacier Park's remote Livingston Range in the distance. The peak just to the right of Mount Edwards is Little Matterhorn, and directly below the Little Matterhorn on the other side rests Avalanche Lake (not in view). 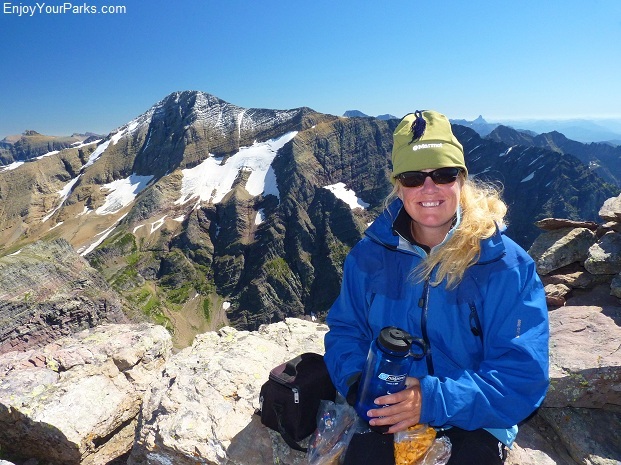 Shannon enjoying a snack on the summit of Gunsight Pass. Mount Jackson towers behind her. 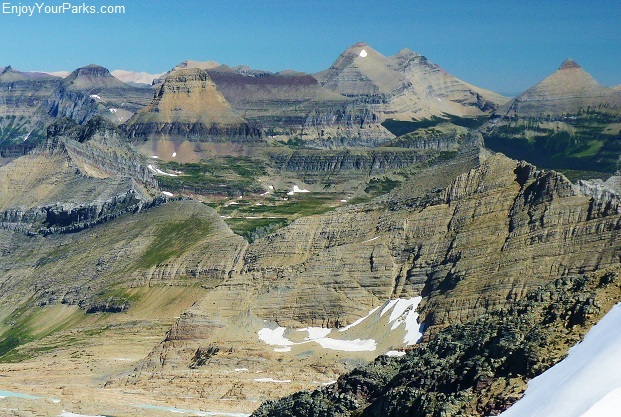 Another view to the east, showing several of the Logan Pass Peaks, as well as the mighty Mount Siyeh in the distant center. 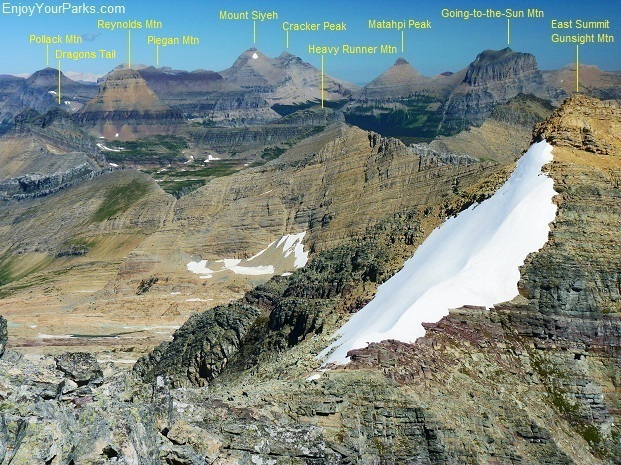 Here are the names of peaks around the Logan Pass Area and beyond. 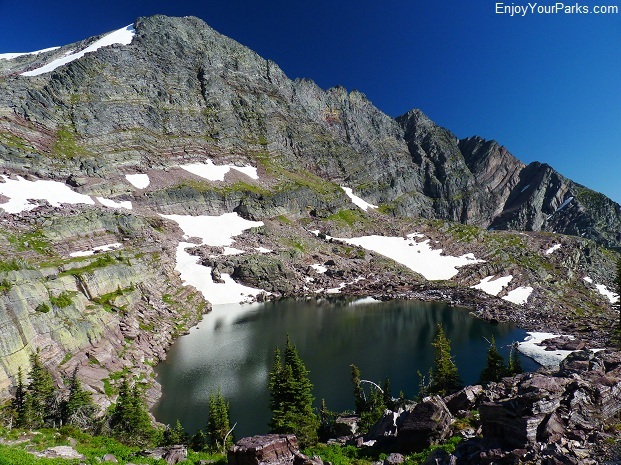 Gunsight Pass is located directly to the left of Lake Ellen Wilson. 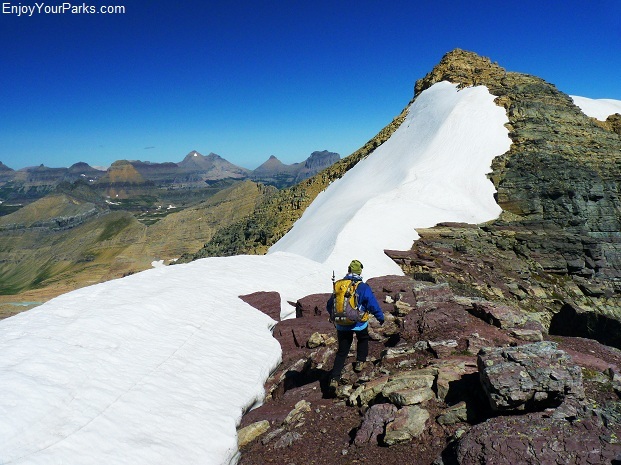 The Gunsight Pass Trail begins at the Going-to-the-Sun Road, then works its way up to the pass, and then down along Lake Ellen Wilson eventually reaching the Granite Park Chalet. It's a great view from the summit of Gunsight Mountain. 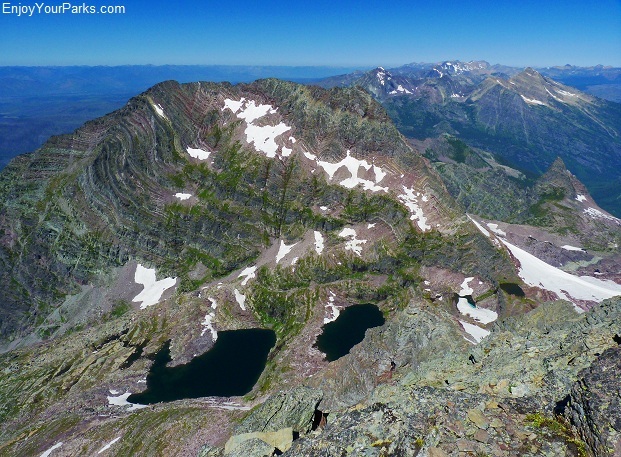 This is a unique view of Mount Saint Nicholas from the summit of Gunsight Mountain. The camera is facing straight south. 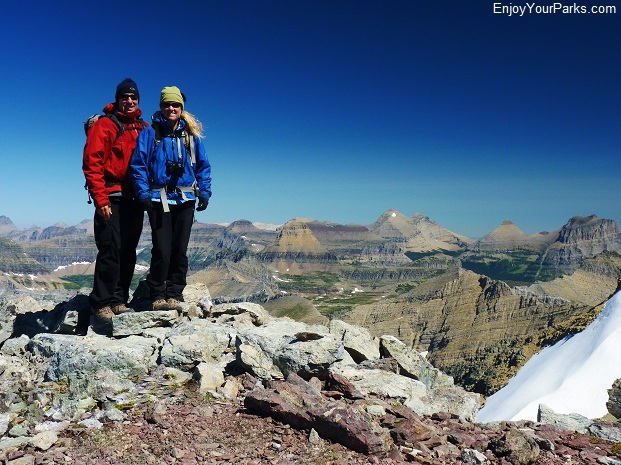 This famous peak (called a spire) is located in the southern section of Glacier Park and is felt my many mountain climbers to be the most technically challenging peak in the park. Here is a view of the Sperry Glacier from Bearhat Mountain. 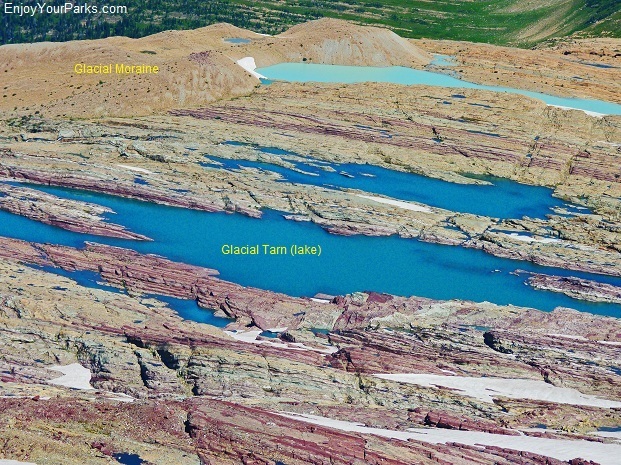 Note the glacial moraine and glacial tarns (lakes) that we showed you on the photo prior to this photo. 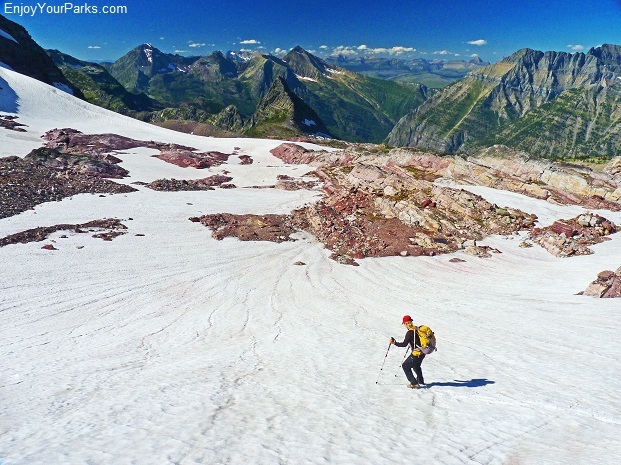 This glacial moraine marks the spot where Sperry Glacier's toe once was. 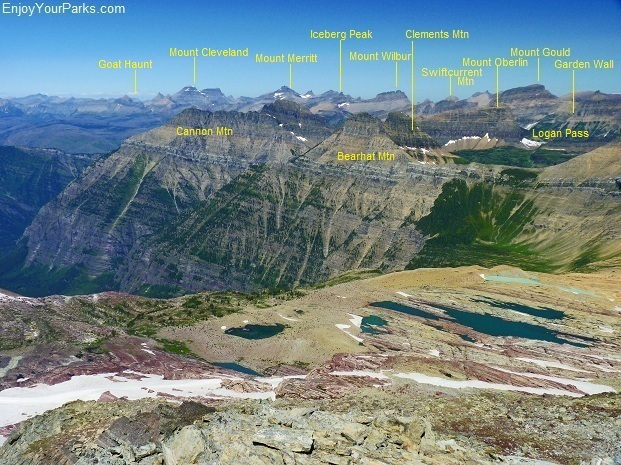 The Livingston Range is one of the most remote places in Glacier Park. 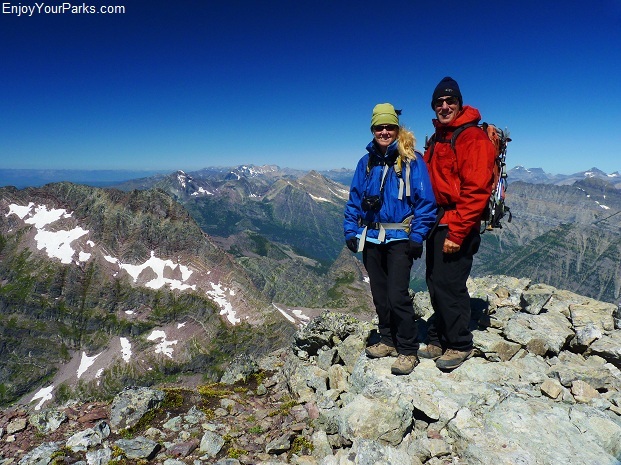 We really enjoyed our time on the summit of Gunsight Mountain. The weather couldn't have been more perfect. Lake McDonald Lodge is about 22 miles from the summit of Gunsight Mountain, and over 6,000 vertical feet below it. That's where our truck is parked. This is a view to the west. The mountains far in the distance behind David are Montana's Mission Range, with the incredible Stanton Glacier resting on the east face of Great Northern Mountain. 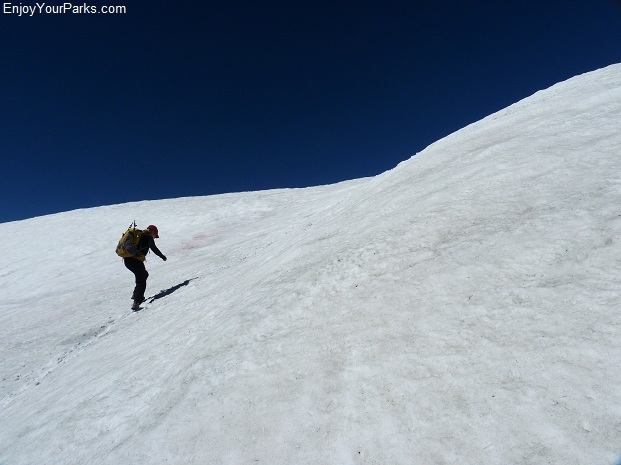 Shannon works her way down the snowfield on our way back down the north face of Gunsight Mountain. It was a perfect day that we'll always remember.